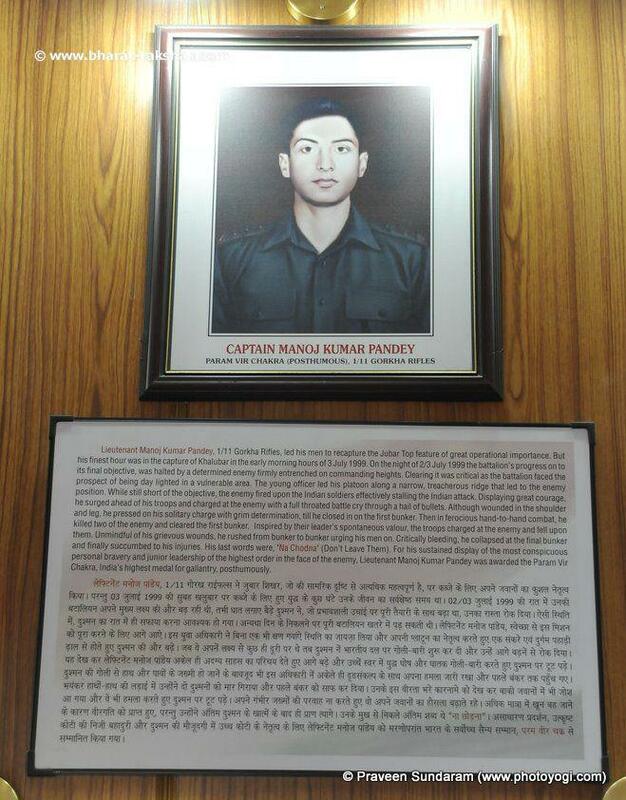 Born on 25 June 1975 in family of Shri Gopi Chand Pandey, Captain Manoj was a brilliant student & sportsman. He was always top in his academics & won hundreds of certificates and cups during his schooling. He cleared NDA in his first attempt, in his SSB interview his assessor asked why do you want to join army-he replayed, to get PARAM VIR CHAKRA…….& he got it. Capt. Manoj Kumar Pandey was a man with a laughing face and happy disposition. He did his schooling at "Rani Laxmibai College" , from there he went to "U.P.Sainik school. He always got first rank in his academics, besides, he was a an all round sports man. His hobbies were Hockey, Swimming and athletics. His mother Smt. Mohini Pandey inspired him towards the morality and spirituality. He did faith in God and had very clear thought about life and death. He firmly believed that everyone has a certain period of life hence one should do something great to inspire the people. he loved children very much. He tried to collect every kind of knowledge so he chose different books to read, even he studied the books of astrology and palmistry. "I am the father of a great son. I know, I can never explain him for he was beyond my understanding and imagination. But I would like to mention some facts the country must know about him. "We belong to a small village Rudha in Sitapur district, UP. I was not well-off when Manoj was born in the same village on June 25, 1975, as my eldest son. I remember, he was very lovable and affectionate to his grand parents as well as to other family members. He was unique in every manner. At school, his subject or syllabus could never rule him, he always ruled over them. In spite of being seriously ill he got unexpected marks in his 10th examination and was appreciated by everyone. Manoj always understood my economic condition and whenever any crisis knocked my doorstep, I found him beside me. Observing the family’s condition, he started helping me in my business. He was adjudged the best cadet in NCC and was awarded by the Governor of UP. I had to spend no money on his education as he took care of himself through his scholarships. "After Intermediate, Manoj was selected for NDA. I think this was the happiest day in his life as he had always desired to go to the Army. I cannot forget his answer to a question at SSB that he wanted to join the Force to be awarded Param Vir Chakra. This answer subsequently shocked everyone related to him as he achieved what he had said.In his own words : "One should join the Infantry in Army and in Infantry one must prefer the Gorkha Regiment". I am happy that he got both his desires fulfilled. On commissioning, he was posted in Kashmir Valley at first. He was then posted to Siachen. On the glacier, he came across varied experiences. After coming back from the glacier, he shared all his experiences with us. He explained about the glacier’s problems and Army’s efforts for survival there. In his own words : "On glacier, people fight the climate more than they fight the enemy". "His holidays were the happiest days in our family. I know those days can not come back. Those days are over with the Kargil war. But in my memory those days are still fresh. In Kargil, my dearest son made his family and the nation proud. It was Khalubar where my son displayed extraordinary courage and great leadership. In spite of knowing very well that he was going to face death, he motivated his troops through his patriotic words. He did not care for his life for he thought the nation is above everything else. I respect his feelings. Only with hand-grenades and a khukri he scared his enemy and left none to flee. And for this great deed of courage, he had to sacrifice his life. His martyrdom will continue to be an inspiration for thousands who want to follow him. "I am proud of you, my son! You are with me every moment in my memory. You are still guiding me. Whenever I am faced with any problem I go in front of his photo, see his face and the solution is always there." 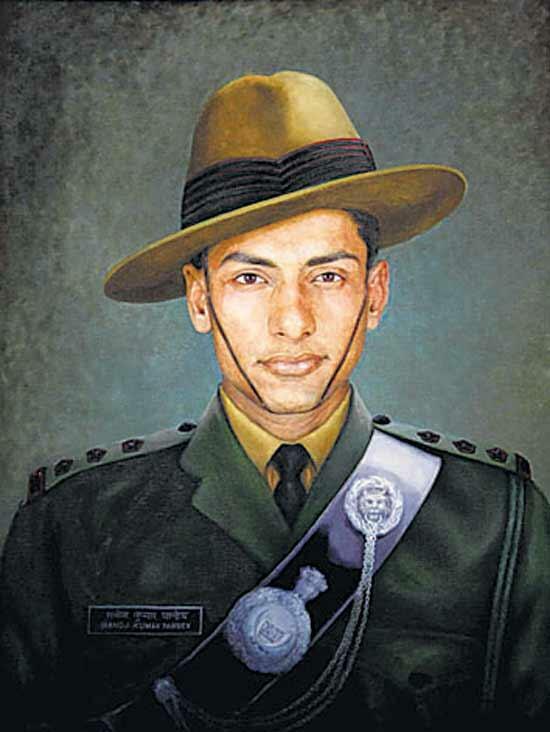 Captain Manoj Kumar Pandey's regiment was in Siachen from there they got order to move to Batalik sector. His commanding officer Colonel Lalit Rai gave him responsibility to re capture Khalubar post. Earlier, two petrol party belongs to 16 Grenadiers and 3 Punjab had gone but after 16 days there was no news of them, they all were killed by enemy's mortar and heavy machineguns fire. Here enemy has sat on an advantageous high positions. Captain. Manoj moved to Kukarthan on where he faced heavy fire, then, he decided to get enemy in night. He halted there and waited till the night. As night falls, by taking advantage of darkness he attacked on enemy, they fought whole night to take on the post. In early morning hours, Capt. Manoj decided to end the night long battle, he, then, went up to the post without caring possible mines. He finally captured the post but lost 9 of his men. Insatiable Capt. Manoj got yet another and difficult task to recapture Jubar post on 11 June 1999. Jubar task was critical as he was to fought in day lighted vulnerable area. He led his to enemy position through a narrow ridge. Enemy started discriminate fire on Indian Troop, he volunteered himself to locate the position of enemy and hit by a bullet in his sholder. But, determined Capt. charged at the enemy with a full throught battle cry Jai Maha Kali, Aayo Gorkhali!!! in between he was again titted by a bullet in his waist. Indomitable Capt. Manoj continued firing at enemy's bunker. Then he charged at enemy with his Khukhari, in hand-to-hand battle he kill two more enemy and cleared first bunker area and inspired by him his the troop fell upon the enemy. Unmindful of his grievous wounds, he rushed from bunker to bunker urging his men on. Critically bleeding, he collapsed at the final bunker and finally succumbed to his injuries, but not before the last of the enemy had been annihilated. His last words were, "Na Chodnu" (Don't Leave Them). 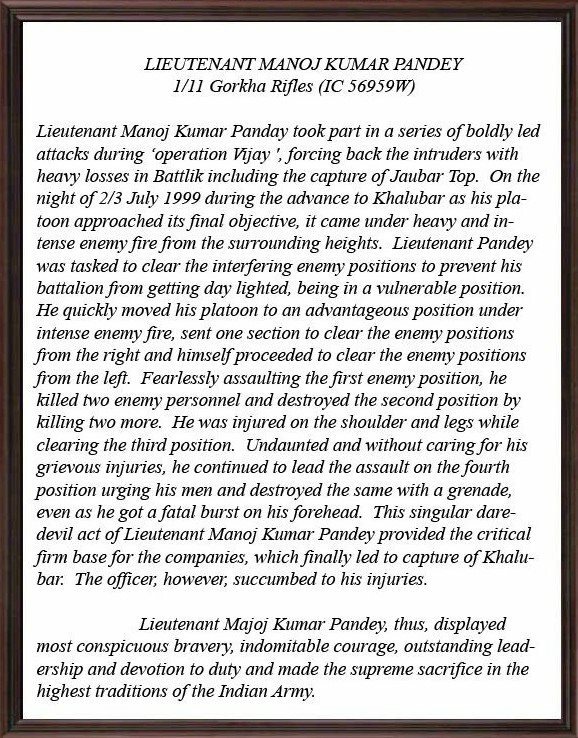 For his sustained display of the most conspicuous personal bravery and junior leadership of the highest order in the face of the enemy, Lieutenant Manoj Kumar Pandey was awarded the Param Vir Chakra, India's highest medal for gallantry, posthumously. Wounded in Batalik after killing 4 Pakis on this day 14 years ago, Capt Manoj Pandey's final words were, "Na chhodnu" ("Don't spare them").